This exciting tour will be targeting the 31 of the 32 endemic birds of the island of Hispaniola (with the other found only in Haiti) including Golden Swallow following it’s disappearance from Jamaica; the highest number of any Caribbean island. Some species such as Ridgeway’s Hawk are rare and endangered, whilst Ashy-faced Owl and Least Pauraque require nocturnal excursions so we will be using top local guides. Day 1 Early-morning flight from London via Madrid to Santo Domingo, capital of the Dominican Republic and transfer to our hotel. Night in the colonial district of Santo Domingo. Day 2 We’ll begin our first full day looking at Hispaniolan Parakeets nesting in a park at a nearby church before continuing on to the extensive and beautifully-maintained botanical gardens, centred on a densely-forested canyon. A morning walk here provides an excellent introduction to the island’s birds. In addition to the very common Hispaniolan Woodpecker, we should find Vervain Hummingbird (the world’s second-smallest bird), Antillean Palm-swift, Black-crowned Palm-tanager, and Hispaniolan Lizard-cuckoo. We can also expect to see the bizarre Palmchat, in a family unto itself, which builds enormous communal nests in palm trees. With some luck we may happen upon West Indian Whistling-duck, which can often be found along a small stream in the gardens. After lunch and some shopping for picnic supplies we’ll make the four-hour drive to Puerto Escondido for a three-night stay. Please note that the six cabins here share two hot-water showers and two toilets, there are no en suite facilities. Day 3 Today we make our first foray into the Sierra. We’ll have a very early start after coffee and depart at 04.00, making the three-hour ascent up the very rough mountain road to visit the northern slopes of Sierra de Bahoruco National Park taking a picnic breakfast and lunch with us. We’ll make a few stops in the darkness looking and listening for Hispaniolan Nightjar. Our main target just after dawn will be the very local La Selle Thrush, which lives in a beautiful but restricted patch of cloud forest, although Red-legged Thrush is much commoner. Other highlights may include Hispaniolan Emerald, Hispaniolan Parrot, Antillean Piculet, Hispaniolan Trogon, Narrow-billed Tody, Hispaniolan Pewee, Green-tailed Warbler, White-winged Warbler (actually a tanager), Western Chat-tanager, Hispaniolan Spindalis and Greater Antillean Bullfinch. After birding the broadleafed forest we will head the short distance uphill into the pines to look for Hispaniolan Crossbill, Antillean Siskin and the insular subspecies of Pine Warbler. We’ll then gradually work our way back downhill into drier forest, with a stop along the Haitian border to witness the destruction caused by charcoal production and the subsistence potato farmers on the adjacent deforested slopes and maybe add a few birds to our Haitian birdlist! The highly-localised Antillean Euphonia may also be seen on this drive before we will return to the Rabo de Gato trail by the camp for a quiet streamside walk through an excellent patch of humid forest. We should see quite a few endemics and a nice array of migrants here and with patient searching Key West, Ruddy and White-fronted Quail-doves can be found walking on the forest floor upslope from the trail and White-necked Crows should be heard and seen here. We may also see our first Broad-billed Todys, Flat-billed Vireos and Stolid Flycatchers whilst Least Grebes are regular breeders in the pools of the creek and some of the truly-rare birds, such as Bay-breasted Cuckoo, occasionally put in an appearance here as well. Day 4 Today will be a spare day to either ascend the mountain again if we missed any important birds or, bird the area around the Cabinas so it will either be an early departure at 04.00 or, a more leisurely breakfast at 06.30. In the evening we will look for Least Pauraque in the adjacent woodland. Day 5 We’ll have an early breakfast and depart at 06.30 to Lago Enriquillo. Lying more than 120 feet below sea level, this intensely saline lake is the remnant of a channel that once divided Hispaniola into two islands. 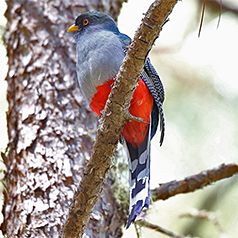 Our primary goal is the Hispaniolan Palm Crow, but we may also see Plain and Scaly-naped Pigeons and White-winged Doves together with an interesting assortment of migrant warblers in the very bizarre cactus forest. After a picnic lunch we will continue on to Barahona for a two night stay. Day 6 An early morning departure up another rough mountain road, this time to look for the highly-localised Eastern Chat-tanager. We will return to our hotel for a late breakfast then drive south to Oviedo Lagoon where we might encounter American Flamingos, Roseate Spoonbills, Mangrove Cuckoos and “Golden” Yellow Warblers singing in the mangroves and a nice selection of migrant waders. If we didn’t see Golden Swallow on day three or four, we’ll head further west and uphill on the paved Alcoa Road to access an extensive upland pine forest. This forest is reminiscent of the longleaf pine forests of the southeastern United States, but here we’ll have another chance to look for Hispaniolan Crossbill and Antillean Siskin whilst Golden Swallow (now a Hispaniolan endemic as the population in Jamaica has disappeared), can also be found at a breeding colony. After a packed lunch, we go south to the shoreline at Cabo Rojo, where a small marsh often holds wading birds, and the local subspecies of Clapper Rail. The cliffs around the cape provide nesting habitat for White-tailed Tropicbird, Cave Swallows and Caribbean Martins whilst Black-capped Petrel, Audubon’s Shearwater and Brown Booby can sometimes be seen offshore. Day 7 We have a long drive back east today so after an early breakfast we will retrace our route back through Santo Domingo stopping on the east side of the city for lunch before continuing through Sabana de la Mar (on the Bay of Samaná) to Cano Hondo. In the evening we’ll have a good chance of encountering Ashy-faced Owl near our hotel in case we failed to locate it during our time in the southwest. Two nights at a very quirky hotel in Cano Hondo, complete with rooms built into the cliffs, numerous waterfalls and small lakes in which you can swim. Day 8 Before breakfast we will search for the critically-endangered Ridgway’s Hawk. This formerly widespread species is now extremely local and infrequently seen. By this time of year adults are usually nest-building, and we hope to have a nest site ‘staked out’ by our local contacts. Getting there will likely involve a relatively short but steep walk but it is well worth it for the chance of seeing this wonderful raptor at its nest! We will also have the chance for repeat views of a number of the endemic birds already seen whilst Turkey Vultures soar overhead in good numbers. In the afternoon we’ll bird locally looking for Common Ground-dove, Greater Antillean Grackle and Yellow-faced Grassquit as well as migrant/wintering warblers such as Northern Waterthrush, Black-throated Blue and Palm Warblers and Common Yellowthroat. Day 9 After breakfast we will drive back to Sabana de la Mar where we will look for waders on the beach and enjoy views of Magnificent Frigatebirds and Brown Pelicans in the bay. We will then head back towards the airport taking lunch en route for a late afternoon/early evening overnight flight back to the UK. Day 10 Arrival back in London at the end of the tour. General Information The climate can be highly-variable at this time of year, from very warm in the lowlands to very cold first thing in the morning in the mountains. Rain is possible even though our tour is pre rainy season. There will be a moderate amount of walking over easy terrain except for the walks for Ridgeway’s Hawk and possibly Ashy-faced Owl, which are more demanding. The two drives into the mountains are on extremely rough roads in four-wheel drive vehicles with four persons plus driver in each vehicle. There are no special medical requirements and insects are not a major problem. Visas (Tourist Cards) are required and can be obtained on arrival at a cost of US$10. Driving distances are quite long, but the roads between sites are good. Group Size Maximum group size: 8 with 3 leaders. Price includes scheduled flights between London and Santo Domingo, accommodation in twin-bedded, en-suite rooms except for three nights in Puerto Escondido where we will be staying in cabin-type accommodation with six units sharing two hot-water showers and two toilets (All tour groups stay here however as it is essential to gain the best chance of seeing several of the endemic birds, all meals, all ground transport, reserve entrance fees and services of the guides throughout. Excluded are insurance, drinks, visas, tips and items of a purely personal nature.